As we enter the fall/winter months, it is with satisfaction that we reflect on a year that has included new challenges and triumphs. In recent months, the doctors’ have been focused on dental education. In July, Dr. Hansen and a local colleague, filmed educational videos as part of a new nationwide education platform for dental hygienists aimed to launch in February of next year. In September, Dr. Hansen spoke at the Spear Education Summit to an audience of 1,200 dentists on her “journey to precision” in dentistry through microscopes. Dr. Spaulding continues her deep pursuit of advancing her skills and knowledge with a concentration on advanced courses on planning and phasing complex treatment, new composite techniques and auto-transplantation of teeth! Another update, Dr. Hansen has joined forces with her fiancé Dr. Gregg Kinzer and Spear Aesthetics in Seattle. This means that in addition to providing dental care to her Gig Harbor and Tacoma patients, she will now be seeing patients part-time in downtown Seattle! In all this growth and excitement, we have also had one big office transition. As you may have heard, for personal reasons, Angel, our hygienist of 10 years has recently retired. With her exit, we welcomed our new hygienist, Brianna Zottman. Angel was involved in the interviewing and hiring process and we feel Bri is a perfect fit for our team. We are excited to introduce you to her in person at your next visit and trust you will feel the same. Wishing you a wonderful fall and holiday celebration! We spend a lot of time educating patients on how to best maintain their dental health as well as dentistry. Routine visits for a professional cleaning remove the build-up of tartar, stain and biofilm but what happens at home routinely matters too. For a patient with implants or periodontal disease, using a water pik may have a huge impact… but what about something as simple as the toothpaste we choose? A RETIRE & A NEW HIRE! Curaprox– Colorful, fun and super soft bristles… this toothbrush provides a massage for your gums! 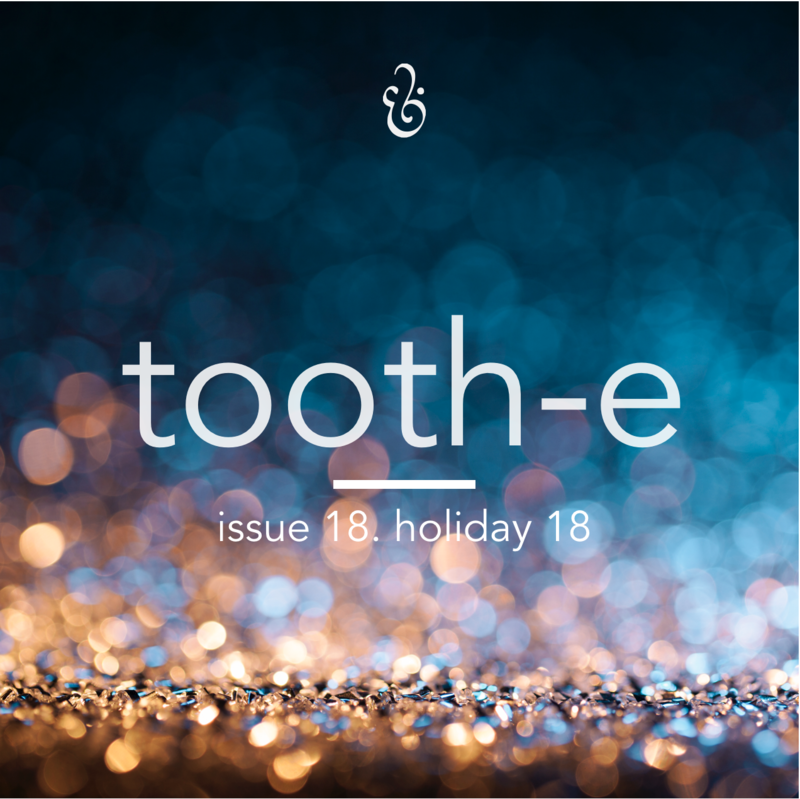 Theodent – Fluoride free toothpaste made with anti-cavity, anti-sensitivity ingredients extracted from the cacao bean! Available in Kids Chocolate Chip and regular Crystal Mint. Gift Certificate - Yes!... we have gift certificates! Spoil a loved one with pre-paid dental work, 1 year of in-house dental insurance or elective services like bleach trays or in-house whitening! Sonicare - The ultimate brushing experience. Did you know that an electric toothbrush remove 85% more plaque than a manual toothbrush. Help a loved one keep their teeth... and keep them pearly white! Water Flosser – This is not meant to be a toy but it sure looks like one!... This may be a gift to yourself for the holidays… You will be in shock at the stuff that is missed with brushing and flossing alone! Over this past year, I have found myself choosing to eat less meat. A good friend who is primarily vegetarian gifted me this book and since then I can barely put it down when it comes to mealtime! Preparing creative veggie meals during the work week can be a struggle but these recipes are simple and amazing! Whatever your diet is… this book is a great find! OR Check out the Oh She Glows Blog! How would you feel if someone cleaned your teeth for you all the time? This is true for certain species of crocodile, whom are accompanied by a particular bird, commonly known as the Crocodile Bird, that clean the crocodile’s teeth. The earliest dentist known by name is Hesi-Re, who lived in Egypt 5,000 years ago. People who smoke are 2-7 times more likely to develop periodontal disease than non-smokers. Coconuts are a natural anti-bacterial food and can help reduce the risk of developing gum disease and cavities.